Any Ball Lock application requires at least two sets of shanks, receiver bushings and liners. The liners are placed into the fixture plate to insure extremely accurate positioning. 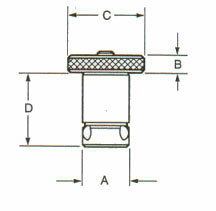 If more than two shanks are required (to provide additional hold down force), omit the liner bushing so that these additional holes will not interfere with your primary locating holes.